Classic black and silver with brass rivoting Weighs only 80 gram (2.8 oz ). 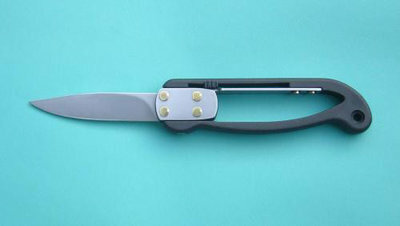 Classic black and silver flipknife with brass rivoting. Good choice for a working knife. A very fuctional cutting tool with a super comfortable handle, made from Zytel which is a material widely used for tool handles, it is very strong, light and shockproof. Satin finished High Carbon Sheffield Steel is an excellent steel used in many cutting tools. Drop point hollow ground blade hardened to Rockwell 58, which is as hard as possible and still retain blade flexabilty. This steel blade will discolour and patina with use - just like a regular saw blade or chisel. Side bolsters ,locking leg and knife fittings are made from stainless Sheffield steel.